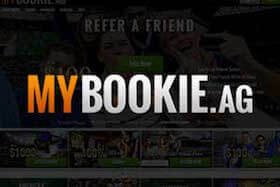 MyBookie.ag is a relatively new sportsbook on the US market. Established in 2014 and registered in Costa Rica, the betting site is regulated by the government of this Central American country. Apart from bets on the most popular sports, you can make your wagers on specials such as business, politics and entertainment. You can even place your bets on which celebrity will die next, oddly enough. Operated by experienced professionals, the betting site is a place where you can make your deposits without worries about the regularity of the gameplay. It is one of offshore sportsbooks catering to American bettors with a good reputation. MyBookie.ag is primarily oriented on the US market, but besides the sports that are popular in USA, you can also bet on Major League Soccer, English Premier League and Championship, Spanish La Liga, UEFA Champions League and UEFA Europe League, among others. The majority of markets are offered on NFL, NCAA, NBA, NHL and College basketball. Lines are posted quickly while odds are not the best on the market, but they are quite decent. When it comes to bet types, you can play Parlays, Teasers, Round Robins, If-Bets and Reverses. You can also choose from a wide array of futures on the major professional sports in the US. Live betting is available on certain NBA, NHL and MLB matches. The minimum bet you can place is $10 while a maximum wager is $1,000. If you are willing to bet higher amounts, you can call the support service to arrange it. As soon as you register with the betting site and make a minimum deposit of $50, you will qualify for a 50% signup bonus up to $3000 free play. To withdraw your winnings from free play you need to achieve the wagering requirements set to 15x. Deposits up to $300 are subject to 5x rollover and your bonus has to be cleared within 30 days. Over your first deposit of $50 or more you can also claim a 20% bonus up to $1,000 with 10x up to 14x rollover. Another signup bonus you can claim is 100% up to $300 with 50x playthrough requirements. Once you are an existing player, you can deposit a minimum sum of $50 and get a 25% reload bonus up to $500. You can also refer a friend and get a 200% bonus on his or her deposit while your friend gets a special 100% bonus. MyBookie.ag also offers a wide range of special bonuses and promotions on certain sports like football, horse races and more. To make deposits you can use Visa credit and debit card, Western Union and MoneyGram or bank wire transfers. Deposits via Visa cards are free of charge, while MyBookie.ag reimburse fees for deposits over $300 via Western Union, MoneyGram or bank wire. You can also make payments in Bitcoins and via phone. To clear your winnings from the account, you can use bank wire transfers, check by courier, debit or credit cards or Western Union service. Depending on a banking method you use, fees on payouts may vary. You can cash out up to $2,000 and payouts in Bitcoins are not allowed. The betting site does not offer free of charge withdrawals once a month. You can contact customer service 24/7 via live chat available on the betting site. Customer service can be reached also via phones given under the contact tab. You can also fill in the contact form and send your question to agents. The site also offers the House Rules section where you can find out more on the sportsbook's policy and rules before you make your wagers. With a short history, MyBookie.ag seems as a good option for US players who want to place their bets on sports matches. The betting site is easy to navigate and you can choose from plenty of competitions both in US and the world. With a range of attractive bonuses and promotions, competitive odds and a great offer of markets, the betting site is definitely moving in the right direction. It should not be long before MyBookie.ag ranks among the best offshore betting sites catering to US players.